Working and living locally also means we understand the impact our IT solutions have on local Canberra businesses. With our local knowledge we recognise the needs of local businesses and can implement specialised solutions and web applications to suit our individual clients. Anthony Gorzalka from Dixon Advisory says a key driver to keeping the relationship between Infinite and Dixon so strong is the personal connection. He says, “problems get resolved without having to go through a number of people,” crucial when running a successful business. “Value for money, innovation and personal service, as well as expertise and an established network setup means we get better business outcomes,” he says. Customer service is at the heart of our business. As a small team of dedicated, Internet enthusiasts in Canberra, we are committed to our work and our community. Our team are reliable and because we are located in your time zone, accessible. We are privately owned and locally grown and run all our operations, including our call centre and technical support, from our local headquarters in Deakin – not offshore. 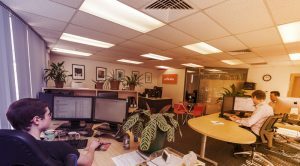 Since 2003, we have evolved from web design and hosting to becoming one of Canberra’s leading Internet Service Providers (ISP) offering the full range of broadband, nbn and Ethernet options. We are the local competition amongst big time players. With us you get customer support without the long wait times experienced with other ISPs. We won’t keep you on hold and we won’t waste your time. At Infinite, we’re not your typical ISP. We understand that people are the most valuable part of our business – both yours and ours. We don’t ever lose sight of our individual strengths and always get the best person working on your project. Let us help you keep your business running.